Move along, Oscars..it’s awards season for aviation! The Crystal Cabin Awards committee has announced its short-list of candidates and the judging panel of industry experts prepare to decide which of these will receive the coveted prize in each of eight categories: Cabin Concepts; Cabin Systems; Electronic Systems; Greener Cabin, Health, Safety and Environment; Material & Components; Passenger Comfort Hardware; University; and Visionary Concepts. The Awards received a record number 95 submissions from 18 countries this year; 78 of these have made it to the shortlist. Last year, ViaSat won a Crystal Cabin award under the category of Passenger Comfort Systems for its high-speed onboard Wi-Fi “Exede® In the Air” product. The company responsible for powering JetBlue’s Fly-Fi product was also installed on select Virgin America aircraft starting last year. Both airlines have capitalised on Exede’s speed and capacity to introduce streaming entertainment onboard and partnered with content giants to increase the entertainment available to their passengers. JetBlue has partnered with Amazon, to give flyers access to Amazon Prime entertainment, and Virgin America has introduced Netflix content streaming. This year, the Crystal Cabin Awards organisers highlight the accomplishments of Gogo in their announcement. The company will fit its innovative 2Ku dual antenna system to aircraft, which combines air-to-ground and satellite service for seamless global connectivity. Awards organisers also point to the trend of onboard wireless In-Flight Entertainment (wIFE) solutions, and for Bring Your Own Device (BYOD) Entertainment, with promising solutions in the works for these categories. Cabin lighting, which has already made great strides creating beautiful and soothing atmospheres onboard the Boeing Dreamliner and Airbus A350, is moving one step further to animation, a trend Boeing showcased at the beginning of this year. “Alongside the growth in entertainment and connectivity, the ‘feel good atmosphere’ is also becoming more and more important on board. Modern LED technology is making it possible to illuminate the cabin independently of flight phase and time of day, so that, for example, a sunrise can be simulated on long flights to minimise jet lag. German cabin fitting specialist Diehl Aerosystems is going one step further with its “Dandelion” concept, allowing coloured patterns and photographic images – passing clouds, for example – to be projected onto the cabin ceiling and overhead lockers,” the organisers state. Animated lighting probably won’t come cheap, but the costs advantages of decorating and updating the look of the cabin quickly, without adding weight or certification costs, makes it a promising development. We can expect to see the creative possibilities introduced in stages over the coming decade. While technology delivers the zero-footprint cabin improvements listed above, it is also making better onboard hardware possible. “Physically tangible innovations are not hard to find in the Crystal Cabin Award shortlist, either. There’s the first airborne timber floor, developed by LIST from Austria, for example, and the first bionic-based 3D-printed cabin partitioning wall from Autodesk and Airbus, stable and at the same time extremely lightweight,” say the organisers. We’re only beginning to explore the flexibility afforded by 3D printing to build light and sturdy structures. In an industry that measures every last gram for approval, it’s easy to imagine 3D printed solutions filling our cabins at an accelerated pace. Boeing celebrates its 100 year birthday, by sharing a vision of the future over the next 100 years of aviation: flying is commonplace and fast enough to take us around the globe in about an hour. When long-haul becomes short haul, in 2116, there may be little need to equip aircraft with anything more than adequate seating capacity. But we’re not there yet. In the mean time, aviation can dramatically improve the passenger experience by leaving design by cabin class in the past, moving forward with projects that separate the space by passenger activities and interests instead. As industry designers imagine these solutions, the opportunities for airlines to monetise the space go beyond the seat to new ancillary opportunities which include on-demand meals and beverages dispensed without requiring crew service, a greater variety of onboard activities and entertainment, work zones, private and family spaces, and even the return of sleeping quarters. It’s easy to remain stuck on traditional cabin divides, harder to shift the design mindset towards a new use of space, but it is certainly not as much of a stretch of the imagination as believing people will fly around the world in the first place. While welcome technological improvements promise to make today’s flying experience better, a paradigm shift would deliver a brand new way to fly. “Once again, the shortlist also includes bold visions for the cabin of the future. The spectrum ranges from an innovative way of dividing the cabin into seating and sleeping areas, as presented in the Zodiac Lifestyle Cabin, to an “Airline of the Future” concept developed by the TEAGUE design studio from America. The team’s “Poppi” case study extends the airline business model with new elements. Companies could sponsor the unpopular middle seat, for example, using it to offer passengers free products and additional services,” the organizers state. New cabin configurations and airline service models could make flying better for airlines and passengers alike. We need only free the mind to deliver a radically different passenger experience. Innovation does not happen in a vacuum. The ready exchange of ideas and healthy competition generated by the Crystal Cabin Awards over the past ten years have fostered many brilliant innovations. It’s easy to be critical of commercial aviation for moving at a slower pace than consumer technology–but consumer technology does not have the same obligations to ensure consumer safety through careful testing and the use of the best, most reliable materials. 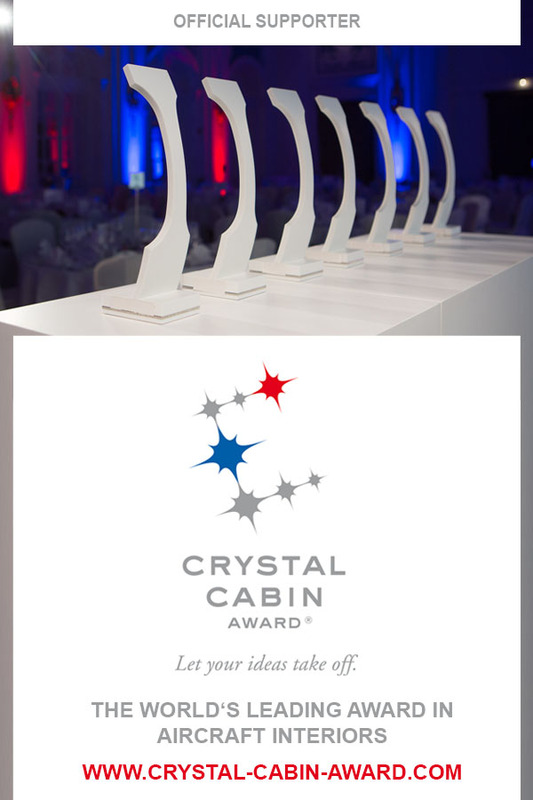 Because the Crystal Cabin Awards are open to members of the industry, and its visionary students, and judged by a panel of industry experts, they balance the practical realities of the airline industry with the greatest ambitious to improve the passenger space. Even the most far-reaching concepts accepted for review and short-listed by the judges rely on sound design principles and can reasonably be deployed–if not immediately then soon. The awards have gained credibility in aviation because they address common problems. They accomplish the true goal of innovation: identify a need and develop a deliverable, viable, reliable solution. “The participation of numerous reputable airlines such as Swiss, Turkish, and Virgin Australia in the Crystal Cabin Award 2016 underlines the fact that this is now much more than just a small event for a small community of specialists,” the organisers state. One could argue that it is because of the great accomplishments of that hard-working small community of experts over the years that the Crystal Cabin Awards have encouraged industry-leading airlines to pay close attention. The Crystal Cabin Award stands for the idea of an independent platform for the industry to promote and honour innovation in aviation worldwide, and is supported by the following sponsors and media partners: Airbus, Aircraft Cabin Management, Aircraft Interiors Expo (Reed Exhibitions), Aircraft Interiors International Magazine, APEX, B/E Aerospace, Bishop GmbH, Aeronautical Engineers, DIEHL Aerosystems Holding, Emirates Airline, FERCHAU AVIATION Division, FlightChic, HAECO Cabin Solutions, Inflight Magazine, Jetliner Cabins, Lufthansa Technik AG, Runway Girl Network and SEKISUI SPI. For more information about the Awards, including sponsorship opportunities, contact the organisers here.